UPDATED: Mon., June 5, 2017, 9:49 p.m.
For the first time in eight years, the Spokane Chiefs have a new head coach. The Chiefs have hired Dan Lambert as the 12th full-time head coach in the team’s Western Hockey League history. The team plans to announce Lambert, 47, as head coach in a press conference on Tuesday at the Arena. “I’m really excited,” Lambert said at the Chiefs’ offices on Monday morning. “There’s lots of good, young talent in this organization and I’m excited to help them grow and I’m certainly looking forward to the opportunity to work with the Chiefs as an organization. “First and foremost, we are extremely pleased to bring a person of Dan’s character into our organization,” Carter said. Lambert replaces Don Nachbaur, the franchise’s all-time wins leader, after the organization declined to extend the veteran coach’s contract following a 27-33-8-4 season in which the team failed to make the playoffs for the first time in 11 seasons. Nachbaur compiled a 261-190-30-19 record over seven seasons with the Chiefs and ranks third in WHL history with 692 career wins. Lambert became available to the Chiefs after being dismissed by the NHL’s Buffalo Sabres organization as head coach of the American Hockey League’s Rochester Americans on May 26. Lambert was head coach of the Americans for one season and compiled a 32-41-3 record. Lambert served as bench coach for the Sabres during the 2015-16 season under then-head coach Dan Bylsma. Bylsma was fired by Buffalo, along with general manager Tim Murray, on April 20 after going 68-73-23 with no playoff appearances in two seasons. After concluding his playing career in 2009, Lambert served as an assistant with the Kelowna Rockets of the WHL for five seasons before inheriting the head coaching job for the 2014-15 campaign. He guided Kelowna to a 53-13-6 record that season and a runner-up finish at the 2015 Memorial Cup. The Sabres, under Bylsma’s suggestion, then plucked Lambert to apprentice with the NHL club for a year before taking over as head coach in Rochester, their top affiliate. But after two disappointing seasons at the NHL and AHL levels, the Buffalo organization made sweeping changes. Lambert’s NHL credentials and experience will be a valuable commodity in working with the young players on the Chiefs. “I think it helps because we have a lot of players that want to move on to the pro ranks, obviously,” Carter explained. 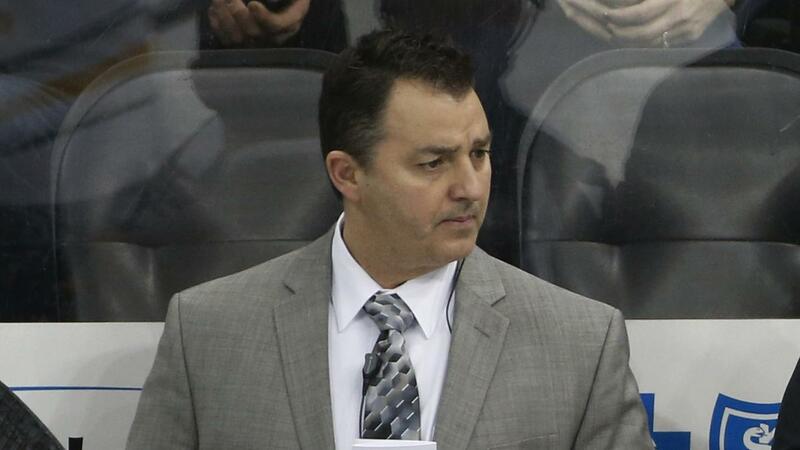 But it’s not just his NHL and AHL experience that sold the Chiefs on their new bench boss. Even though Lambert was on the other side of the country and in the pro leagues, he kept tabs on the WHL and expressed that he’s plenty familiar with what’s going on. The WHL is a training and growth league for players and coaches alike. Lambert might have aspirations of making back to the NHL, but understands what he’s signed up for with the Chiefs. “The way I approach it is, I’m in Spokane right now and my job is to win here,” he said. “My job is to help these young men to grow and get them to where they believe they want to go and to help them along. Lambert’s relative youth as a coach is a departure from Nachbaur, one of the longest-tenured coaches in the WHL. Carter is realistic about Lambert’s recent experience in the NHL and AHL. Lambert has also coached on the international level, serving as one of Canada’s three head coaches for the 2014 World Under-17 Hockey Challenge. Lambert enjoyed a 20-year playing career, with 29 games of NHL experience with the Quebec Nordiques in 1991-92, scoring 15 points. Lambert started his playing career as a 16-year old in 1986 with the WHL’s Swift Current Broncos, scoring 75 goals and 244 assists over four seasons, winning the Memorial Cup and tournament MVP as a player in 1988-89. Later, Lambert scored 308 points in 353 games over five seasons with San Diego, Los Angeles and Long Beach of the International Hockey League. In that league, he was a four-time all-star and received the Governor’s Trophy as the league’s top defender in 1998. Lambert also played professionally in Germany for 10 seasons before retiring as a player in 2009. Published: June 5, 2017, 1 p.m. Updated: June 5, 2017, 9:49 p.m.